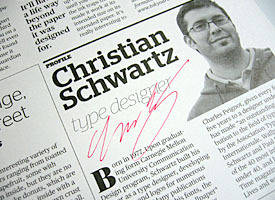 TAB Talks #4 with a N.Y. based type designer Christian Schwartz. I didn’t think that I could meet him in Japan. Christian Schwartz, based in New York, held a talk show at 5tanda Sonic event space in Gotanda, Shinagawa Ward, Tokyo . There was huge audience to see his show in spite of hard rain. 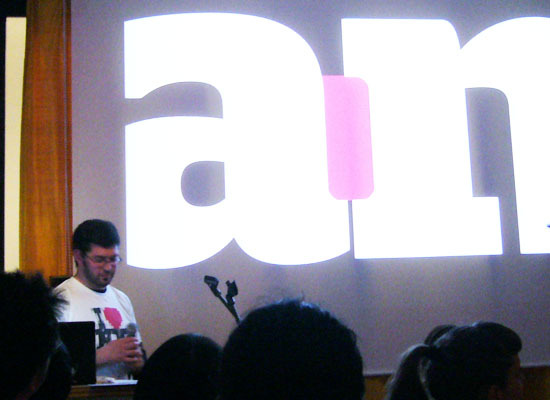 Wearing a lovely “I love N.Y.” T-shirt, he started to show some customized fonts for some major companies like Esquire, Deutsche Bahn (the German national railway company) and the Guardian, and explained the background stories of these customized fonts using a lot of specimens. One of them, a typeface called Haçienda was developed for the Guardian, which is a famous news paper in UK. Haçienda, eventually renamed it Guardian, had a dynamic family more than 100 styles covered wide range weights and several kinds of styles like Serif, Sans and Slab styles, which would be released by the end of this year. Christian told us a full story of the design process from beginning to end. After the show, I met him to ask some questions about his works, and I showed him my portfolio to get some opinions. He seemed to be interested in my heavy weight style fonts and told me some opinions. Thanks for the opportunity to meet with you, Christian! (Left) Christian explained the difference among three styles of Hacienda. (Right) A brochure for the audience of this presentation and a Christian’s autograph on it. And I must say thank you to Chris Palmieri of AQ design studio. He was a coordinator to hold Christian’s presentation in Tokyo. He was very familiar with Latin typefaces and had some interviews with type designers that he was interested in such as Jeremy Tankard, which was on AQ’s web site. He helped me out a lot to have communicate with Christian. He was a very nice guy and really kind to me. 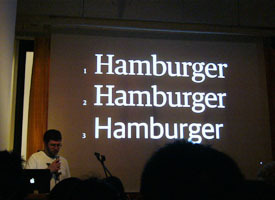 Christian’s presentation was held again at Robundo inc., a well-known publisher on typography in Japan, in Shinjuku Ward, Tokyo, before his leaving from Japan due to a request by a member of Society of Typography in Japan.